The Skinny: Thought-provoking religious tale from award-winning director Im Kwon-Taek, focusing on the lives of two very different nuns and their separate journeys toward personal enlightenment. In intertwining these two stories, the film successfully explores issues regarding a woman's role in Korean society and the place of religion in the modern age. 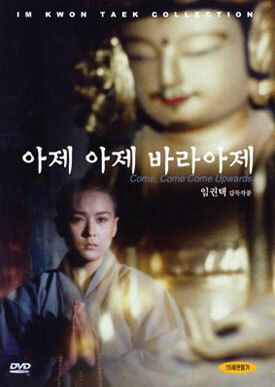 Legendary director Im Kwon Taek tackles issues of faith and gender in Come, Come, Come Upwards, his 1989 religious-themed drama that took home Best Picture honors at the 27th Grand Bell Awards. This critically-acclaimed tale centers on the everyday experiences, personal hardships, and nagging philosophical questions faced separately by two very different Buddhist nuns, as they each try to discover and ultimately come to terms with their uncertain place in the universe. Through their various misadventures, the film alludes to the status of women in Korean culture at the time, and raises questions about the utility of Buddhism in modern society. Although the film achieves this feat through the utilization of dual protagonists, one of the women involved is clearly the lead. Early on, we are introduced to Lee Soon-Nyeo (Kang Soo-Yeon) as she first approaches the nuns in a secluded Buddhist temple. As the film follows her concentrated efforts to earn acceptance into the convent, the narrative cuts intermittently to her earlier life and the experiences that may have motivated her to join the nunnery in the first place. In these flashbacks, we learn that, as a high school student, Soon-Nyeo led an unhappy life, often clashing with her mother. As a result, a Buddhist monk enters their lives, and Soon-Nyeo quickly guesses that he is indeed her missing, presumed dead father, who left their family years ago to join the priesthood to atone for his sins. Meanwhile, a handsome young teacher joins the faculty at Soon-Nyeo's school, and she ends up pursuing the widowed educator on a cross-country trip that unfortunately ends in sadness and humiliation for both of them. Back in the present day, Soon-Nyeo works diligently to earn the respect of her peers, but her all-too-self-assured interpretations of Buddhist scripture earn her reprimands from the abbey's Mother Superior. Eventually, however, the old nun sees definite potential in Soon-Nyeo, agreeing to not only confirm her status as a nun, but install her as a personal assistant of sorts. This turn of events happens in tandem with the demotion of Jin-Sung (Jin Yong-Ming), a naïve, by-the-book nun who has long enjoyed her position as the Mother Superior's second banana, but knows little more than how to follow orders and memorize Buddhist texts. Not long after a philosophical interchange between Jin-Sung and Soon-Nyeo that is witnessed by several other nuns, the Mother Superior decides Jin-Sung needs more experience and sends her away to learn more about the outside world. There, she confronts perspectives she had never considered, learning that her rote imitation of Buddhist scripture fails to live up to the expectations of the real world. Early on, an eager young novelist approaches her to debate the merits of seclusion, the ultimate goals of Buddhism, and the religion's decreasing popularity among Koreans in the face of Christianity. Later, after being given a riddle to solve by the Mother Superior, Jin-Sung secludes herself in the mountains, choosing to meditate alone in a cave. However, she soon discovers that she has company in the form of a wily old monk who will test her faith in ways she never imagined. At the monastery, Soon-Nyeo plays the Good Samaritan when she saves the life of a drunken criminal who attempts to commit suicide in the ruins of an old temple. Unfortunately, no good deed goes unpunished, as the man becomes fixated on Soon-Nyeo, seeing her as his savior, guide, and potential wife. His increasingly obsessive behavior ends up disrupting the day-to-day activities of the convent, which forces the powers that be to expel her. Without any means of support, she accompanies the man, only to find herself being raped by him. Instead of dividing them, however, the experience ends up bringing them closer together, as they live as man and wife and begin to turn things around. All seems well until tragedy strikes, which leaves Soon-Nyeo alone once more, bouncing from man to man, adventure to adventure, until her long and winding path finally leads her back to the nunnery, as it does Jin-Sung, to take care of the dying abbess. Ill beyond belief, the Mother Superior hangs on just long enough to find out, what, if anything, her two star pupils have learned during their separate journeys. When Soon-Nyeo and Jin-Sung finally reunite at story's end, the audience finds that while they may be standing in close proximity in a purely physical sense, they are miles apart philosophically.